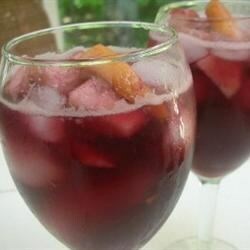 "This is the sangria that my friends taught me to make in Spain. It's quick and easy and makes a great drink to mix up for a summer party." In a large pitcher, combine red wine, sugar, apples, peaches, bananas and cinnamon sticks. Refrigerate for 6 hours or overnight. When you're ready to serve, stir in the lemon-lime soda. It was excellent. I would have liked to give it 5 stars for kid friendliness, but I'm not sure that children should be drinking wine (even if it is mixed with lots of fruit and lemon-lime soda). We doubled up the recipe for a large crowd and everyone loved it! I got so many compliments on this sangria. I made it w/ a papaya/mango/melon mix of frozen fruits and it was delicious.